« Why is pressure switch deadband such a crapshoot? How do I ignore negative values on a Honeywell paperless recorder? When you’re dealing with process recorder functions, some actions don’t like negative values, like a totalizer that sees a negative offset at zero flow as backflow, which impacts the total. But on the Honeywell X-Series paperless recorders, you can work around the issue, so they report only the positive values. To report negative values as zero and pass positive values through as-is, use Honeywell’s over math expression (pen > Edit Maths = math statement). The expression over[x,y] returns x if x is larger than y. Otherwise it returns zero. Any negative value in the user variable (uv1) is reported as zero. 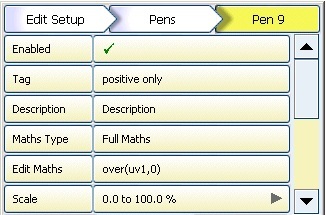 Any positive value in the user variable (uv1) is reported as found. Note: This will require use of six firmware credits in your recorder for Full Maths, since it is not part of the basic math functionality. This entry was posted on November 9, 2011, 2:24 pm and is filed under Configuration, Honeywell, Modbus, Paperless Recorders, Recorders, Trendview X-Series Paperless Recorders. You can follow any responses to this entry through RSS 2.0. You can leave a response, or trackback from your own site.